Do I need previous experience to be a tutor? No, we will train you. We ask tutor trainees to have at least a high school diploma or a GED. You will need to fill out a volunteer application form and provide two references. 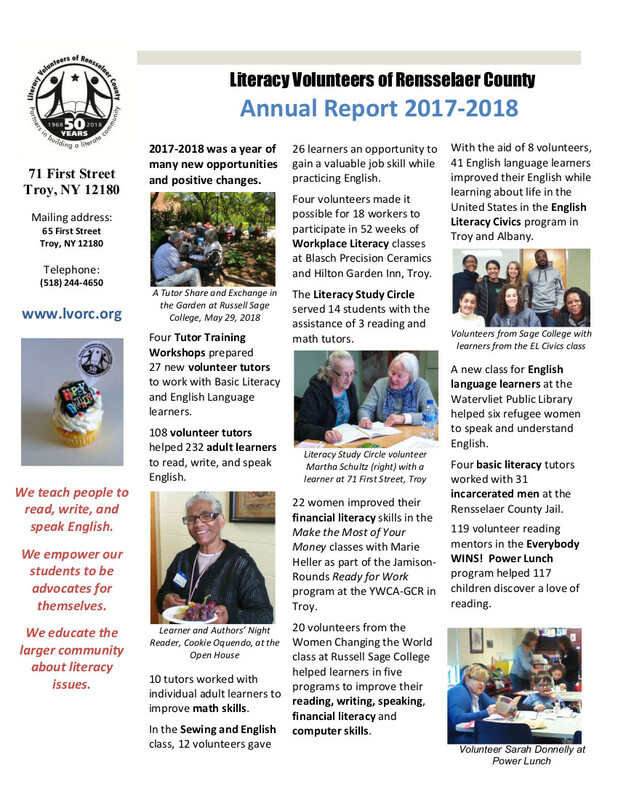 Who uses LVORC’s programs and services? Our learners come from all walks of life. About half of our learners are American-born adults who need to improve their reading, writing, math, and computer skills. We also serve immigrants and refugees who are learning to speak English. To view a video that gives an excellent idea of the people who come to us for literacy help, click here. What is the Tutor Training Workshop? The Tutor Training Workshop consists of six 3-hour sessions, during which you will have the opportunity to learn about, practice, and discuss the process of tutoring a Basic Literacy Learner (BLL) or an English Language Learner (ELL). (Those who wish to attend both the BLL and ELL modules for a total of eight 3-hour sessions are encouraged to do so.) The Tutor Training Workshop will give you valuable information about the way adults learn. It will prepare you to use appropriate techniques for teaching adults. Our highly experienced volunteer tutor trainers will guide you through the material and lead you in exercises to practice what you learn. By the end of the training, you will be able to use a number of successful strategies with learners, create lesson plans based on your learner’s abilities and interests, and help your learner to set realistic goals. What if I miss one of the sessions of the Tutor Training Workshop? The same training is also offered by other Literacy Volunteers affiliates. If the training is being offered by another affiliate at or near the same time, you can attend the session you missed at another location, but you must contact that affiliate to register for the session. Is there a charge for the Tutor Training Workshop? We ask tutor trainees to pay a fee of $35 to cover the cost of a text book and supplemental materials. If the fee presents a hardship, scholarship money is available to cover the cost of the materials. When will I be paired with a learner? You will be paired during the Tutor Training Workshop. Can I choose my learner? Each tutor trainee is provided with a list of prospective students from which a student can be selected. LVORC has about 50 students waiting for tutors at any given time. Are there resources for me to use as a tutor? Yes, LVORC has a resource library for tutors. Our staff can help you to locate additional resources and answer questions about tutoring. A Tool Kit for Tutors and Learners is available on our website. Where do tutors and learners meet? We encourage tutors to meet with learners at public locations such as libraries and community rooms. Locations should be convenient and accessible to both parties.